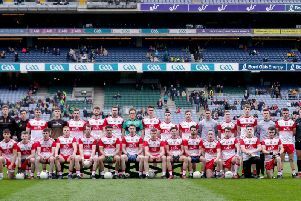 Derry senior hulers Sean McCullagh, Ruairi Convery and Conor Quinn have been named on the ‘Christy Ring Champion 15’ team after the annual hurling All Stars were announced. Banagher star McCullagh captained Tom McLean’s Oak Leafers to last season’s Christy Ring Cup final in Croke Park and, alongside Swatragh’s McCullagh, was part of an impressive Derry back-line throughout both the National League and Christy Ring campaigns, Quinn often operating as a hugely effective sweeper. The experienced Convery remained Derry’s attacking focal point after overcoming injury to play his part in the run to Croke Park. The awards will be presented at Friday night’s GAA GPA All-Stars banquet sponsored by Opel at the Convention Centre, Dublin. Uachtarán Cumann Lúthchleas Gael Aogan Ó Fearghail said: “These awards acknowledge the undoubted talent that exists at every level of inter-county hurling. It also serves as a reminder of the pursuit of excellence that runs right through these competitions from start to finish”. Having lost the last two Christy Ring Cup finals, Kerry’s 1-20 to 0-12 victory was third time lucky as the Kingdom collected their second Christy Ring title and it is no surprise they dominate the All star selection with Shane Nolan, John Egan, Pa Kelly and Keith Carmody all recognised for their contributions. Down (2 players), Kildare (2), Mayo, London, Meath and Wicklow have players awarded with a place in the prestigious selection of being the best of the best in this competition in 2015.